The Prince Aly Khan Hospital in Mumbai, India, was established in 1945 and has since built a reputation for quality care. Its strengths include cardiac surgery, surgical oncology and, since 2008, bone marrow transplant. The Aga Khan Health Services Maitreya Project in India, supported by the World Bank, trains young women from 14 villages around Maitreya Block on pre- and post-natal home care, so that they can help promote awareness of Maternal and Child Care among expecting mothers and their female relatives. AKHS doctor giving a dose of iodinated oil as next takers register with volunteers, Chitral, Pakistan. 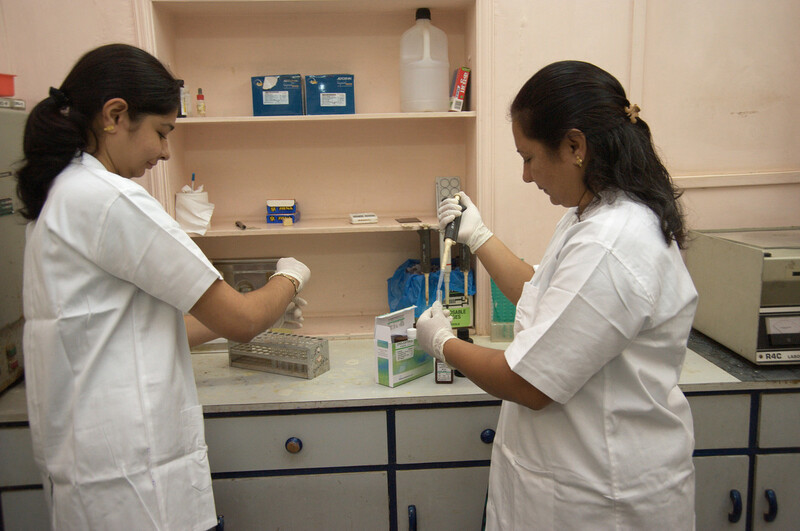 Based in Keshod Block (India) since 1995, the AKHS Diagnostic Centre was created to respond to the lack of quality care in government diagnostic centres. The AKHS brand has since built a reputation for quality. The first institution in the Aga Khan Health Service, Pakistan (AKHS,P) was a 42-bed maternity hospital - formerly known as the Janbai Maternity Home, which opened in Karachi in 1924. Today, while maintaining that early focus on maternal and child health, AKHS,P also offers services that range from primary health care to diagnostic services and curative care. It reaches over 700,000 people in rural and urban Sindh, Punjab, Gilgit-Baltistan and Chitral. As the largest not-for-profit private health care system in Pakistan, its goal is to supplement the Government's efforts in health care provision, especially in the areas of maternal and child health and primary health care. The Primary Health Care Centre at Rehri Goth, Karachi, Pakistan. AKHS,P funds come from a variety of sources. As a vital ingredient in social welfare systems, which aim to become self-sustaining, user fees are consistently set, even for the most highly subsidised services. AKDN is testing a wide mix of financing tools, including micro-insurance and the use of vouchers to protect the poor and reduce the reliance on user fees. This principle is actually serving to broaden access to AKHS,P services. When facilities become self-sustaining, AKHS,P uses any operating surpluses they generate to finance other programmes and to subsidise services to the very poor. AKHS,P addresses the health problems of specific local populations in Pakistan. To do so more effectively, its health care system is decentralised, and the services it offers vary according to the needs of its five programme regions in Karachi, Sindh, Punjab, Gilgit-Baltistan and Chitral. In the rural areas of Pakistan where AKHS,P operates, reaching people in remote areas with primary health care services, especially the high-risk groups such as mothers and young children, continues to be a high priority, as is the provision of adequate diagnostic services, curative care, and referral services for the general population. AKHS,P operates 125 basic health centres, 6 comprehensive health centres and the Aga Khan Gilgit Medical Centre. AKHS, P now also operates 5 government health centres in public-private partnership agreements. In the North of Pakistan, AKHS,P has been implementing the Northern Pakistan Primary Health Care Programme since 1987. Working in partnership with local communities, the government, and other AKDN institutions, like the Aga Khan Rural Support Programme, the goal has been to find sustainable ways of financing and delivering primary health care in the high-mountain valleys. This has led to a village-based approach -- the designation of community health workers by the local village organisation, the training of these workers in community-based disease prevention, and the reorientation of health professionals (government and private) to primary health care. Through this and related programmes, AKHS,P has been working to promote a new orientation of health services in Pakistan towards primary health care. Close collaboration with the Aga Khan Foundation (AKF) and the Aga Khan University (AKU), as well as with the government health systems, has been the cornerstone of this endeavour. This is driven by a desire to build health systems linking preventive and curative care efforts, as well as the different levels in the AKHS,P and the government health systems, from the village health centre to the Aga Khan University Hospital in Karachi. أُنشئ مركز التشخيص التابع لمؤسسة الآغا خان للخدمات الصحية منذ عام 1995 اعتماداً على مجموعة كيشود (الهند)، وذلك استجابةً لنقص الرعاية الجيدة في مراكز التشخيص الحكومية. ومنذ ذلك الحين، قامت مؤسسة الآغا خان للخدمات الصحية عبر خدماتها الفعالة ببناء سمعة جيدة. Prince Aly Khan Hospital is a 162-bed multi-specialty acute care hospital that, by extending the range and quality of its clinical services, has become the hospital of choice for the local population within its catchment area in South Mumbai. The hospital is ISO 9002 certified. 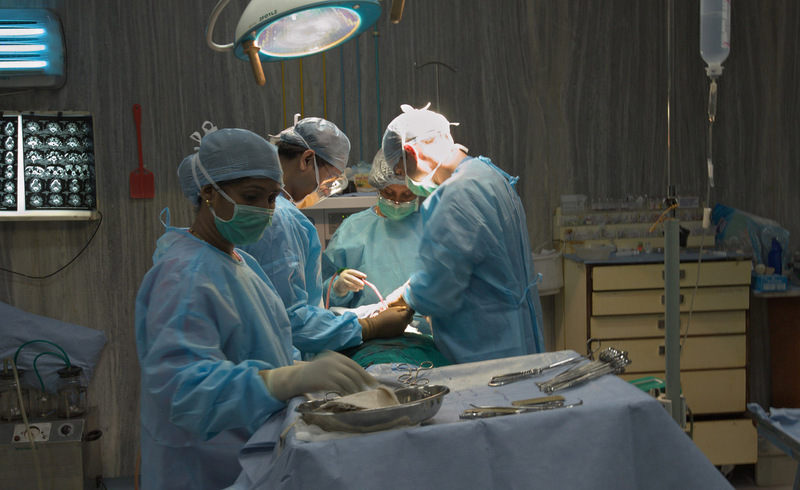 Programme development is constrained by severe space restrictions and the Aga Khan Health Service, India (AKHS,I) is planning the phased development of a 300-bed replacement hospital providing some sub-speciality services and having a major emphasis on ambulatory and intensive care as well as research and education. The Prince Aly Khan Hospital in Mumbai, India. The Community Health Division of the Aga Khan Health Service, India (AKHS,I) seeks to achieve its objectives by improving the health behaviour of the programme population in relation to hygiene, use of oral rehydration, immunisation, maternal care, risk factors for preventable non-communicable diseases, tuberculosis, information and services for child spacing. Barriers to access to health services of a satisfactory quality are being identified and will, if possible, be eliminated. At the primary care level, the focus has broadened from maternal and child health to strengthening family health. The focus of health promotion efforts is being extended to include the prevention of non-communicable diseases, AIDS and gender-sensitisation activities. Research priorities include risk factors for mental illness, influencing behaviour in relation to non-communicable disease risk factors, HIV, reproductive health and TB, and health financing.